Pumpkin fruit is one of the widely grown vegetables that is incredibly rich in vital antioxidants, and vitamins. This humble backyard low calorie vegetable contains vitamin A, flavonoid poly-phenolic antioxidants such as leutin, xanthin, and carotenes in abundance. Put everything in a blender and blend on high. If you are looking for a healthier ice cream then use 2% or non-fat milk and skip the evaporated milk. 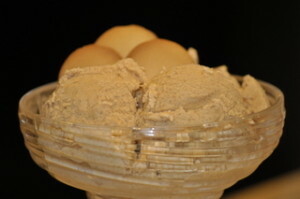 To make a richer eggnog type of ice cream add in 2 eggs. Once the mixture is completely mixed, then pour it into your ice cream freezer and freeze. ‹ How can Your Personal Trainer Help You Achieve Bodybuilding success?